Microsoft has finally added Mojang's Minecraft to its repertoire of Windows Phone games, two months after buying the company. Minecraft: Pocket Edition appears to be the same version that's available for Android and iOS, and costs the same, too: $6.99. It requires Windows Phone 8.1. Given that its download size is just 12 megabytes, it seems realistic that the game will run on even low-end phones with just 1 Gbyte of RAM. 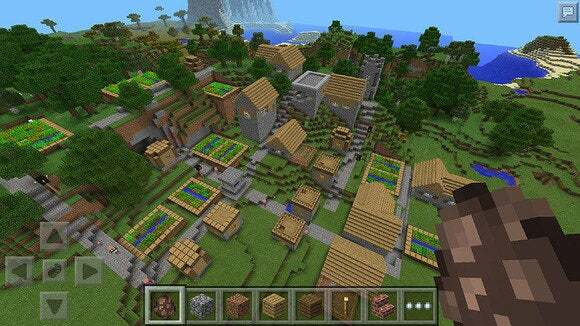 Minecraft: Pocket Edition can be played in either the traditional Survival mode, or else in Creative Mode, where gamers can treat Minecraft as a sandbox and build what they choose. Gamers can either play in single-payer mode, or multiplayer via Wi-Fi. It's hard to forget Minecraft creator Markus "Notch" Persson's dig at Microsoft almost two years ago when he told Microsoft to "stop trying to ruin the PC as an open platform" ahead of the launch of Windows 8 and its Windows Store. But Persson's criticisms of Microsoft didn't stop him from working with the Xbox team to bring Minecraft to the Xbox One earlier in September, and then selling Mojang to Microsoft for $2.5 billion in mid-September. In a blog post on his personal site in September, Persson said he gave up active Minecraft development some time ago. But as the creator of such a popular game, he is still tied publicly to the game's development. Why this matters: Obviously, porting a game to your own smartphone platform is critical if your company owns the game—especially if you spend a whopping $2.5 billion on it. Microsoft hasn't said how it plans to take Minecraft and Mojang forward, but building a Windows Phone version would seem to be one small piece of the puzzle.